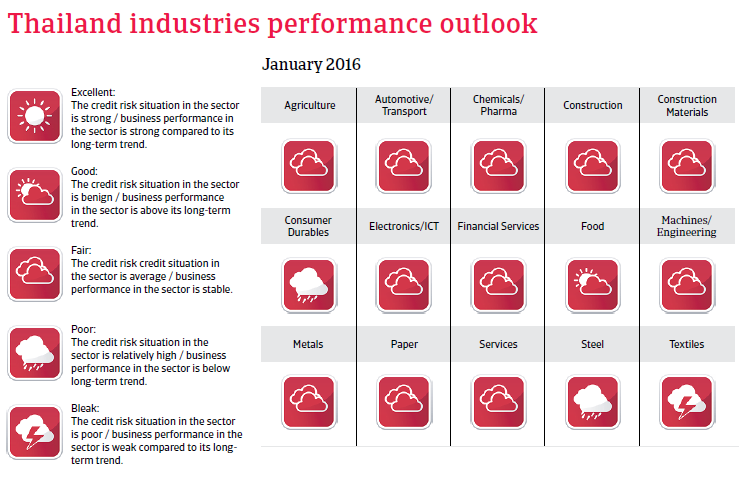 GDP growth in 2016 (up 2.5%) still below the country´s growth potential, and political uncertainty remains an issue. In 2013 and early 2014 the political crisis in Thailand escalated again, combined with mass demonstrations and violent street protests. In May 2014 the removal from office of Prime Minister Yingluck Shinawatra by a Constitutional Court´s verdict was immediately followed by a military coup. A National Council for Peace and Order was formed, headed by General Prayuth, who has been appointed prime minister. The military junta imposed martial law and a national curfew, and has repealed the constitution. The military junta is determined to remain in power for the time being. A new constitution has been drafted, designed to curb the powers of populist politicians, e.g. by transferring major political powers to unelected bureaucrats at the expense of an elected parliament. The government announced that the new constitution will be submitted to a public referendum, however it is still unclear when it will take place. At the same time, the government announced that general elections will not be held before 2017. This means that a certain degree of political stability seems to be assured in the short term. However, in the long term, political uncertainty remains a major issue, given that the underlying structural conflict arising from the deep political, social and economic division between the old establishment (royal court, army, judiciary and urban upper class) in the south and the rural poor in the north has yet to be resolved, and is unlikely to disappear soon. High income inequality and poverty has increased social instability, which together with the current autocratic political trend increases the likelihood of renewed large scale protests - and the incentive for the military government to introduce costly populist transfer policies in order to appease the rural poor. Political uncertainty led to a low 0.9% economic growth rate in 2014, as investment and government spending decreased and business and consumer confidence were negatively affected. That said, with the return of political stability, growth picked up again in 2015, mainly supported by increased domestic demand and higher government consumption, strong public investments in infrastructure, productivity enhancement and fiscal stimuli for businesses. 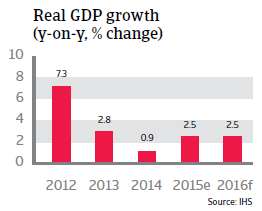 Government spending is also expected to sustain GDP growth in 2016, forecast at 2.5%. The increased public spending is expected to lead to only slightly increasing public deficits in 2015 and 2016, as an expansion of the tax base will generate additional revenues. The military junta has stopped the costly and inefficient rice purchase programmes of the former government, which proved to be a serious liability for government finances. Reliance on tourism exposes Thailand to economic downturns in other economies (especially China, which accounts for a major share of tourist arrivals) and risks from security issues. 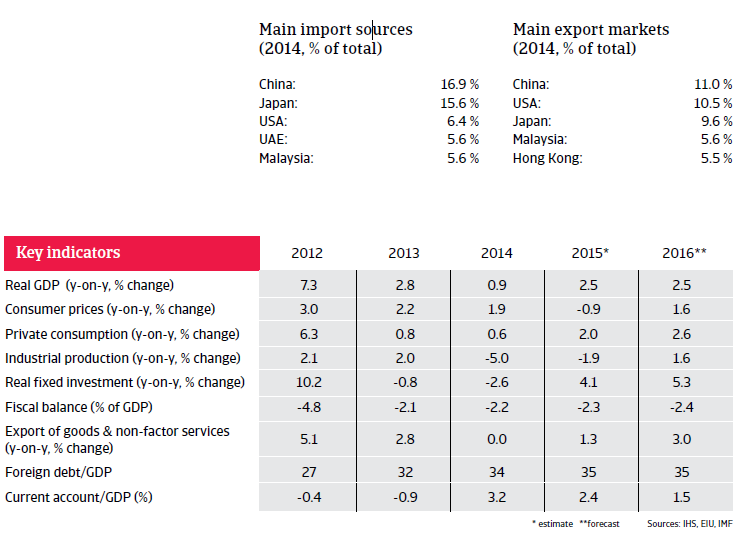 Regarding exports, decreasing Chinese demand has had an impact, but Thailand’s export markets are rather diversified. In contrast to some of its Southeast Asian peers, it is not a major mineral exporter which depends on China for the bulk of its exports. 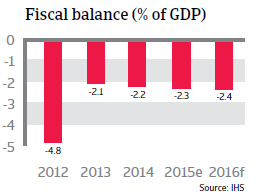 Thailand´s current account surplus is expected to decrease in 2015 and 2016, and with relative competitiveness in decline, the surpluses will be largely the result of lower import volumes combined with falling commodity import prices. High household debt, inequality and low incomes (especially in rural areas) limit the prospects for future increases in consumer spending. With more than 150% of GDP, private sector debt is extremely high compared to standards in other Asian countries and more advanced economies. Debt driven domestic demand cannot be expected to rise in the long term, leading to slower growth rates in the future. 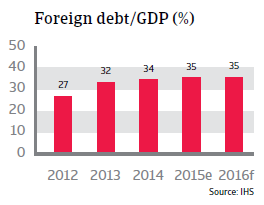 Thailand´s public debt (47% of GDP) is sustainable, with external financing amounting to only 15% of it, while foreign currency denominated debt amounts to just 4.5% of GDP, insulating the government from external shocks. The country´s solid payment capacity and liquidity is underpinned by moderate foreign debt (in 2015: 35% of GDP and 51% of exports, with short-term debt amounting to 42% of GDP). International reserves are forecast to amount to about seven months of import cover in 2015 and 2016. Thailand is relatively insulated from negative external trends through its currency, which is one of the most stable ones in Southeast Asia. Short-term portfolio investment is rather low, while inflows of more long-term foreign direct investment (mainly from Japan) is stable. Thailand´s sovereign and currency risk is low, and the short-term economic outlook is positive, but the long-term perspective is more negative, due to decreasing international competition, high private debt levels and the looming political uncertainty. While current economic growth is mainly based on government investment and a return of business and consumer confidence, the latter could decrease again in case of renewed political turmoil, e.g. before the next general elections. Thailand´s political future remains uncertain, given the persistent deep political, social and economic division within the country. Thailand´s automotive sectors is characterised by high entry barriers as the players in the market are large multinationals with strong financials and good know-how.